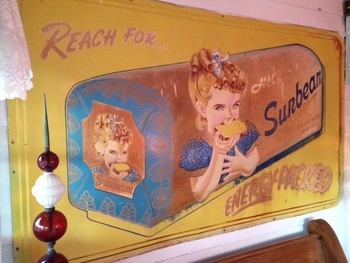 I've been trying to buy this 1950's three-dimensional Sunbeam tin bread sign that's 4' x 7' for about a year. I stopped in last week and saw the man and he said if I gave him his price he would sell it. I thought for about a minute and reached in my pocket got the money and bought it. I paid alot more than I wanted but I have never seen this sign in all my years of picking. I say three-dimensional because the loaf of bread sticks out from the sign several inches. I've tried to show you that in the photos but not much luck. I moved some things around and it's hanging on my back porch for everyone to see before they go in the house. 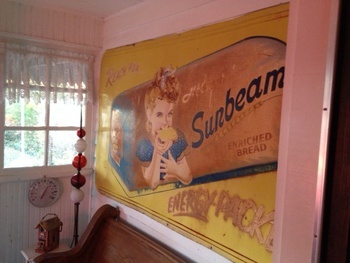 The logo reads Reach For Holsum Sunbeam Enriched Bread Energy-Packed. 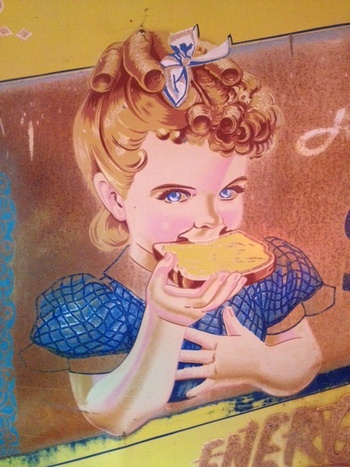 The first Sunbeam bread girl was Patty Michaels. She was chosen in the 1950s and portrayed Little Miss Sunbeam. Thank you jonima for the love and the compliment! Thank you walksoftly for the love and the compliment! Thank you Aimathena for the love and the compliment! Also thanks on the church pew! Is that church pew underneath the sign? Really like that also. Thank you flask for the love! That advertisement was popular when I was a kid. Great find! Thank you Jono for the love and the compliment on the church pew! Michael , you should open up an advertising firm! beautiful sign buddy! Thank you RonM for the love and the great compliment! Thank you Trey for the love! Have a great week! Love the sign and where you have it hanging. Love Little Miss Sunbeam. I still eat Sunbeam bread almost every day. Nice lightning rods too! Congratulations! I regret buying lots of $25 - $100 stuff. I NEVER regret buying the expensive quality pieces for my collection. Congrats on your purchase! Thank you Joey for stopping by and commenting! Have a great week! Thank you tommy1002 for the love and the nice compliment! Thank you RAD21289 for the love! Good luck on your next find! Thank you AmberRose for the love! Absolutely perfect on your porch! Thank you Parkerhouse for the love! Thank you Belltown for the love! Thank you lisa for the love! Thank you aycockonxion for the love! Thank you undreal for the love! Thank you tom61375 for the love! I got to say this, that you and Sean68 look like the same person. You could be brothers? Thank you rlwindle for the love! Glad this brought back some great memories! have a great weekend! Thank you mikelv85 for the love! Have a great day! Thank you Windwalker and AntiqueToys for the love! Thank you gwlove32 for the love! Thank you mackay1st for the love! Thank you Lady_Picker for the love! Welcome to CollectorsWeekly and have a great weekend! Thank you vintagegirl66 and Virginia.vintage for the loves! Also thank you Virginia.vintage for the nice comment! 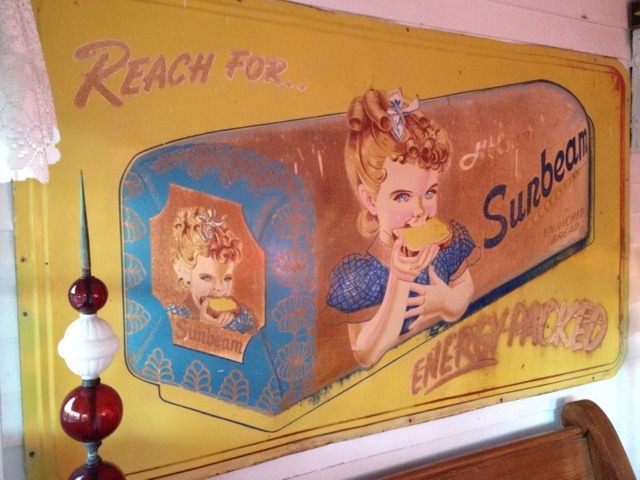 I grew up on both Sunbeam and Betty Lou bread. I remember the sign that said Betty Lou for .22. 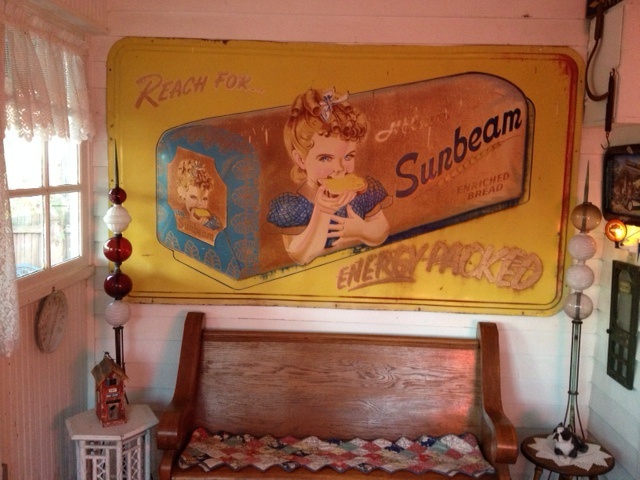 Sunbeam was selling more so Betty Lou was 22 cents a loaf. Hamburg was 28 cents a pound and gas was 18 cents a gallon. Where did it go? Thank you Mae_444 for the love and the nice comment! Thank you Virginia.vintage for the love! Re love it anytime. Always appreciated! You are lovely Michael, many thanks! Thank you fhrjr2 for stopping in and commenting on the past! Glad I stirred up some old memories! I'm going to be 60 this year and I don't know where the times gone. Thank you Prells6 for the love! Officialfuel - Never worry about where the time has gone. I remember turning 60 and wondering the same thing. Use your experience to try and teach others. Some will listen and others will put you down. Bottom line is you lived it.....did they? Share your wisdom and experiences. Thank you fhrjr2 for the words of wisdom!!! Enjoy the rest of your weekend! Thank you katherinescollections for the love and the the nice comment! Thank you riverruntspookguy for the love! Thank you sanhardin for the love ! Thank you jscott0363 for the love! Thank you crswerner for the love! Merry Christmas! Thank you beyemvey for the love! Thank you AnnaB and oldpeep for the love!